While impulse is a change in momentum, specific impulse (commonly abbreviated Isp) is impulse per unit mass of propellant. Isp is the efficiency of a propulsion system. For real engines, Isp varies with both altitude and thrust; nevertheless, Isp is useful for comparing propulsion systems; much like "miles per gallon" is used for different car models. As specific impulse increases, amount of propellant decreases needed for a given amount of momentum; thus, a propulsion system is more efficient. This concept differs from energy efficiency, which can decrease even if specific impulse increases. Many propulsion systems with high Isp require large amounts of energy. Also, note that thrust and specific impulse are different concepts. 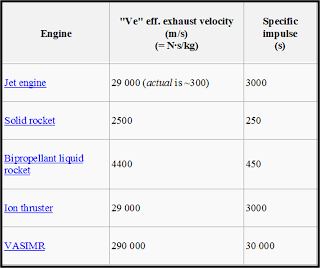 Isp measures impulse per unit of propellant; however, thrust measures force from an engine exhaust. It’s common for high Isp systems to produce low thrusts; for example, an ion thruster has a very high (Isp = 3000 seconds) but very low thrust. To calculate specific impulse, only consider propellant in the vehicle. For a chemical rocket, mass of propellant is both fuel and oxidizer; for air-breathing engines, propellant mass includes the fuel not the air mass flowing through the engine.